I'm not going to try and act like this is some family recipe that my grandma wrote out and gave to me as some special family heirloom to hold on for years to come. If I'm being honest, I hit Google, trying to stifle the nerves that were building inside of me. Chocolate souffle? Really?? I'm a burrito and lasagna kind of girl. But when Valentine's Day came around, I knew I had to step up my game. 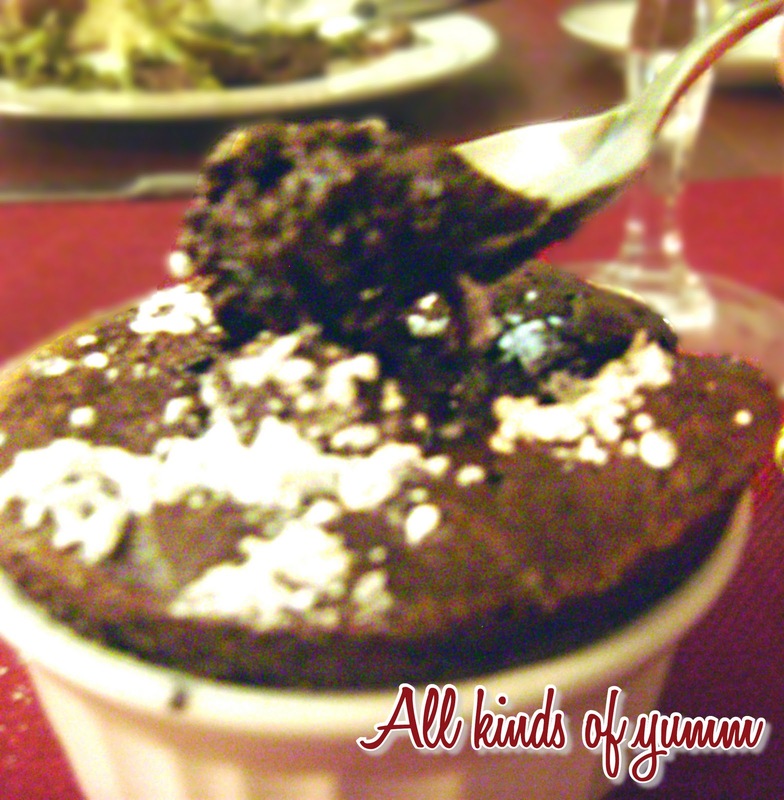 I searched high and low for the easiest chocolate souffle recipe I could find. Being a newby, I was looking for simplicity. I came across this recipe by Curtis Stone, and it really was as easy as he said it was. This particular recipe is for two souffles, but the wonderful thing about this website is that you can change the amount of people you want it to serve, and it updates the ingredient list. I watched his step-by-step video, which was extremely helpful since it was my first time making this, and I would highly recommend doing the same if you're a scaredy cat like me. And you didn't hear it from me, but he's not bad to look at. I'm still going to copy his recipe and directions here, but like I said, I can't take credit for it. Enjoy! Coat the interiors of six 7.75-ounce soufflé dishes completely with some of the butter. Refrigerate until the butter is cold and set about 2 minutes. Brush a second coating of butter over the interiors of the dishes. Coat the interiors completely with sugar. Place the dishes on a baking sheet. Using an electric mixer beat the egg whites in a large bowl until they are foamy. Gradually beat in 1/3 cup of sugar. Continue beating until the egg whites are shiny and form medium-soft peaks when the beaters are lifted. Meanwhile stir the chopped chocolate in a large bowl set over a saucepan of simmering water until melted and smooth. Remove from the heat. Add the water and cocoa powder and mix until smooth. Fold a fourth of the egg white mixture into the chocolate mixture. Fold in the remaining egg white mixture (the mixture will resemble chocolate mousse). Divide the soufflé batter equally among the prepared soufflé dishes. Using a large knife level the filling flush to the top of the dishes. Using a clean cloth wipe the very top edges of the dishes. Bake the soufflés on the baking sheet until they puff but are still moist in the center about 12 minutes. Serve immediately. This was my first ever experience eating a chocolate souffle, and it was just as good as you'd guess. My husband, whose whole life is on a diet, ate his entire souffle. P.S. Please forgive the awful photo. You wouldn't believe how hard it is to take a decent picture by candle light with your husband trying to get a "thumbs up" in there. My life is complicated.